It’s been a while since the last update, but no, we haven’t stopped hopping. Life got hectic and have to take a breather sometimes. Speaking of that, Coast and Company makes a great place to unwind. With its secluded location, you can really call this an “escapade”, of course, unless you stay right around it. 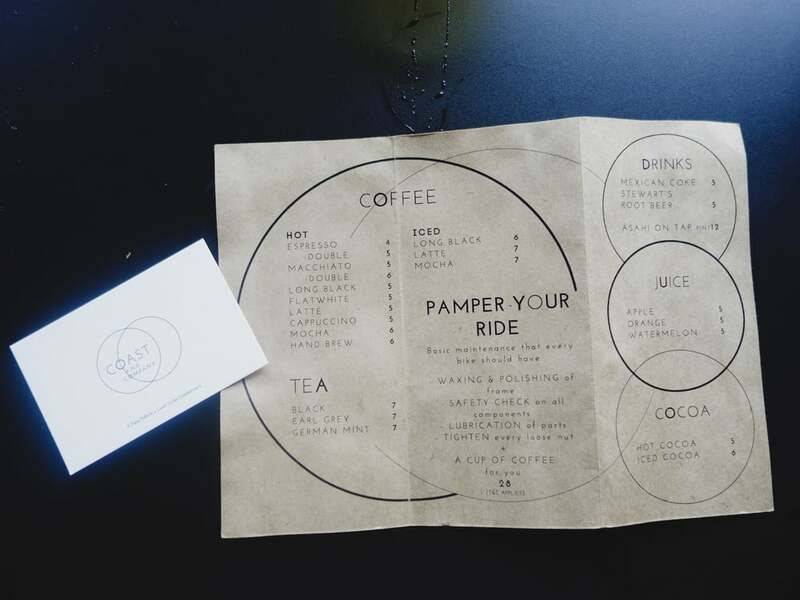 A trusty coffee partner and a boutique bicycle shop, this combination has worked its charm. From its exterior to its interior, you could tell great efforts had gone into conceptualizing of the place. Industrial look has been the in thing lately, but Coast has made it even more raw, down-to-earth and relatable. The seats aren’t the most comfortable, I had to shift from side to side. However, there was a line who was prepared to replace me in my seat. It amazed me how popular it was, considering how inaccesible it was. If you take a look at Coast Cycles Facebook, you would start falling in love with bicycles too. They do great marketing with the amazing photos, like the one above. Sure enough, every industrial and indie cafe has to have an impressive artpiece to complete. Here you find a tap that is from the 80s, in a design that belongs to the 21st century. If you seek comfort in coffee like I do, you might find some in this cuppa from Papa Palheta, a long standing brand in the industry. The coffee here is mild, pleasant and balanced. What is a Sunday brunch without eggs and toast? Coast Breakfast arrived too simple for its long description but it tastes of good ol’ scrambled eggs and savoury sausage. Nothing to shout about, but good enough to satisfy an empty stomach. Overall, I would love to say I enjoyed my visit at Coast and Company, a place where everyone is chatty, happy and enjoying. It was a good place to bask in people’s incessant chattering, unwind in the comfort of friends and enjoy a cup of good coffee.